Veal is somewhat tough to come by in my neck of the woods. It's hard to find; especially fresh and often you won't find the particular cut you need. When you do come across a store that has exactly what you're looking for you can rest assured it will be pretty darn expensive. Case in point: AJ's Fine Foods, the only place I found in my neighborhood that sells fresh veal cutlets, and the cost is $26.99 per pound. Now if I didn't mind driving and purchasing the veal in advance I could get it frozen from Hobe meats for only $12.99 per pound. But since I often want what I want when I want it (only child syndrome) I usually end up spending a small fortune. Tonight was one of those small fortune nights. I've been craving veal milanese for some time now and when I came across this recipe on Food & Wine I figured...why not. So I broke down; stopped at AJ's; spent $20 for 1/2 lb of veal, a head of bibb lettuce and an heirloom tomato; came home and enjoyed a quick, easy, expensive meal. And THAT is why I only buy veal at restaurants when I'm out to eat. Which is too bad because I love it so much. I haven't had veal in ages. That looks just too good. I cant remember the last time I have had veal - this looks good! 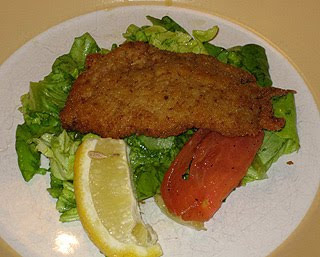 I make pork milanese often which is really delicious but veal milanese sounds and looks extraordinary. I'll have to follow your lead and splurge on some veal cutlets sometime soon! It is crazy expensive! I don't get it out where I live and I have been so disappointing. The last few times I needed ground veal I have had to be satisfied with ground lamb. :( It's definitely not the same. Theresa.. thank you so much for the cookbook!! I received it yesterday and I am so exited! Oh, my husband adores milanese, but I never make it for him. This has inspired me, maybe I'll give it a try! It's crazy how expensive veal is nowadays. When I was growing up, my mom made veal milanese for Sunday supper all the time. It was always more expensive than chicken, but not anything like it is today. At least it seems that way to me. i can't imagine how it feels, it is certainly very delicous and tempting.